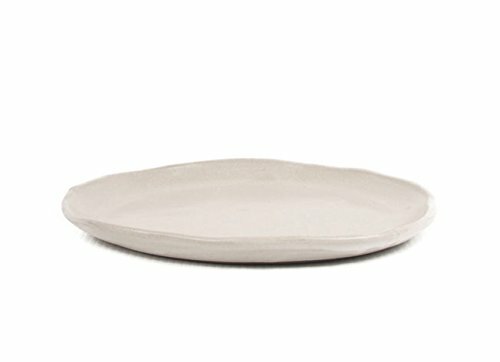 Hosley's Mud Serving Platter, 15" Diameter, White. Perfect for serving main courses at breakfast, lunch or dinner, the versatile plates are also great choices for dinner parties. Can be used as a decorative centerpiece in your Dining room. Ideal for Weddings, Special Events, Parties. Also Makes a Great Gift. PRODUCT: Hosley's Mud Serving Platter, 15" Diameter, White. USES: Perfect for serving main courses at breakfast, lunch or dinner, the versatile plates are also great choices for dinner parties. They are just the right gift for a wedding or special occasion. BENEFITS: A welcome centerpiece for your tabletop. The platter makes it a match to industrial-chic, modern organic, or exotic home decors. MEASUREMENTS/MATERIAL: Each one measures 15" L x 15" W x 1" H and made of ceramic. HOSLEY BRAND PRODUCTS: Hosley brand products are made from quality raw materials with minimal wastage at every step of production. With the goal of achieving a neutral carbon footprint, please recycle and help leave Mother Earth better off for future generations. If you have any questions about this product by Hosley, contact us by completing and submitting the form below. If you are looking for a specif part number, please include it with your message.